Sorry to those waiting that this took so long, I’ve been sick this past week, and I’ve had a few large tests to take, which I had to study for. 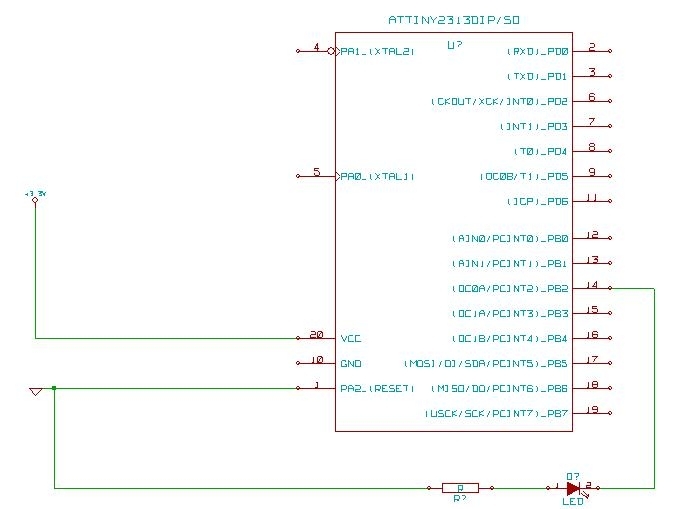 Anyway here it is, the how to for the micro controller project I posted about earlier(link to earlier blog post). The first step is gathering the materials you will need, just click on the names for links to either Digikey or electronic goldmine, both are great for buying electronic components. Also included is links to download the software I use. Thats it for materials, if I missed something, or you need help with something, just post a comment. 2. place the LED on the top row and make sure that one leg goes in one row, and the other in the next row down(seccond from top). Make sure the short leg goes in the top row, and the long one in the next. 3. place the resistor in the same row as the shorter leg of the LED(each LED has a long and short leg), and place the other lead(leg) of the resistor in the next column of rows(see last picture for clarification). 4. place battery holder on the bottom row and up for however many rows it takes, might have to tilt it a little. 5. place tiny2313 on the divider between the two collumns of rows, make sure each of the pins of the 2313 have their own rows, except the bottom left one, put that in the same row as the battery holder — side. MAKE SURE THE GROOVE IN THE TOP OF THE 2313 IS POINTING TOWARDS THE TOP. 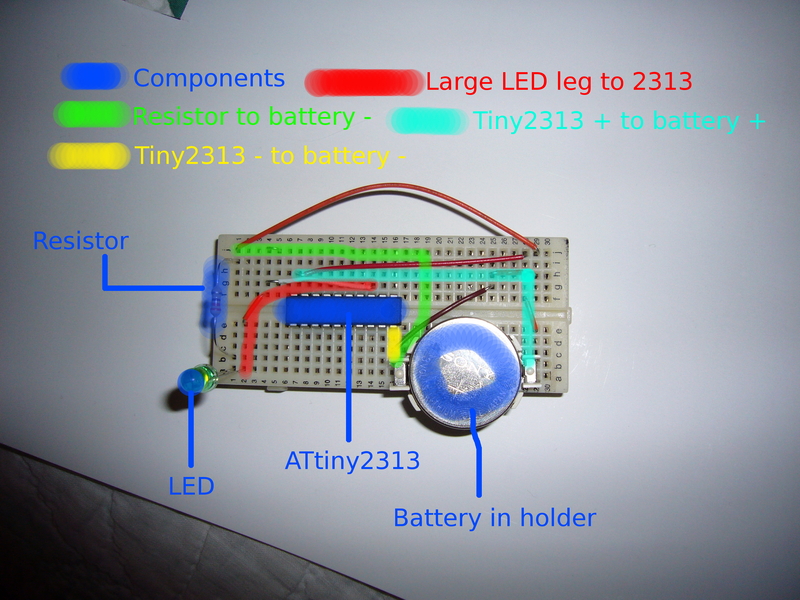 6. place the jumpers, connecting the other lead of the resistor to the — side of the battery holder, the top right pin of the 2313 to the + side of the battery holder, and the long lead(leg) of the LED to the 7th pin down on the right side of the 2313. ~ by emudeath on April 3, 2009.